We're available anytime when you need a company you can trust to repair your furnace. 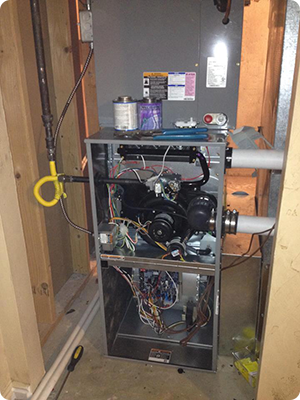 We offer same-day and emergency furnace repair at no additional charge. All furnace repairs are backed by our 100% Satisfaction Guarantee. You can count on us to do the job right, the ﬁrst time. Our furnace repair technicians receive the most up-to-date training, and are qualiﬁed to repair all major brands and models of furnaces. Every member of our team must pass extensive background checks before they are hired, as well as ongoing random drug testing, so you know that your home and your family are safe with us. You won't have to worry about open-ended hourly charges, or hidden costs when you trust CW Heating & Air to repair your furnace. We offer fixed-pricing on all furnace repairs, so you know the total cost in advance, regardless of how long the repair takes. Our flat-rate diagnostic charge covers the cost of having a certified technician come to your home and diagnose the problem with your furnace. Furnace Repairs Are 100% Guaranteed. No fine print. Straightforward Pricing. No open-ended hourly charges. No Extra Charges For Emergency Repairs. We're here whenever you need us. Professional Furnace Repair Technicians. Highly-trained, courteous, with verified background checks. We Repair All Major Furnace Brands And Models.